As an audio format that uses lossless compression algorithm, the FLAC audio can be reduced to 50 – 60% of its original size while offers the same quality as original audio file. However, FLAC playback support in portable audio devices and dedicated audio systems is limited compared to format such as MP3. FLAC support is included by default in Windows 10, Android, Blackberry and Jolla devices. For Mac users, you will get no luck to play FLAC files on your Mac computer, iPhone, iPad. The following article will share top 5 best FLAC Converter for Mac to fix FLAC Mac playback issues. Key Features: Using AppleScript, this free software converts PC, APE, WV, FLAC, OGG, WMA, AIFF and WAV files to MP3, which is one of the most popular and compatible audio formats available. Key Features: This software can decode, convert or play various ‘lossless’ audio formats on Mac OS, and can help you convert your FLAC audio file to another, more compatible format. Key Features: MediaHuman Audio Converter is a free audio converter program that helps you convert FLAC to another, more used and popular, lossless audio format, such as AAC, WAV, OGG, AIFF or WMA and MP3. Key Features: fre:ac is a free audio converter and CD ripper for Mac OS and in addition to FLAC, it supports MP3, MP4/M4A, WMA,AAC, WAV, OGG and Bonk audio formats, to which you can convert your FLAC file to. From above lists, we can see that every FLAC Converter for Mac listed above has its own drawbacks and limitation to prevent you to get full entertainment of FLAC audio on Mac. In addition, when compared with the desktop Mac FLAC Converters, the conversion speed is too slow especially when you try to convert a large FLAC file or multiple FLAC files. What’s more, most of those free FLAC Converter lacks continuous upgrade and development, therefore, they are often not that stable during the conversion process. The last important point, those free FLAC Converter often make a compromise for the output audio quality, you are very likely to get a audio with poor quality. If you are looking for a reliable and stable program to convert FLAC files with perfect quality and fast conversion speed. 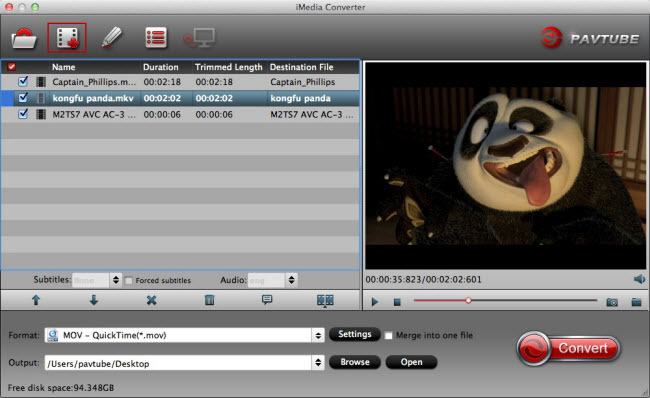 We highly recommend you our best Mac FLAC Converter – Pavtube iMedia Converter for Mac to you. It outweighs all above listed free Mac FLAC Converter by offering 30x times faster conversion speed. In addition, it produce high quality results, you can’t find any difference between the result audio and the original FLAC source audio. What’s more, Pavtube iMedia Converter for Mac also offers beneficial audio customization and editing function to help you to enhance your output audio to another high level. You can flexibly adjust output audio codec, bit rate, sample rate and channels to get better output audio quality. Edit audio by trim or cut FLAC audio to remove unwanted parts or segments, merge separate audio clips into one single file. Step 1: Load FLAC audio files. Download the free trial version of the program. Launch it on your computer. Click “File” menu and select “Add Video/Audio” or click the “Add Video” button on the top tool bar to import FLAC audio files into the program. Tips: The program supports batch conversion mode, so that you can load multiple FLAC audio files into the program. Clicking the Format bar, from its drop-down list, select one of your desired audio formats to output, here, we choose to output FLAC to the most popular MP3 audio under “Common Audio” main category. Tips: Click “Settings” on the main interface to open “Profile Settings” window, here, you can flexibly adjust output audio codec, bit rate, sample rate, channels, etc as you like to get better output audio quality. 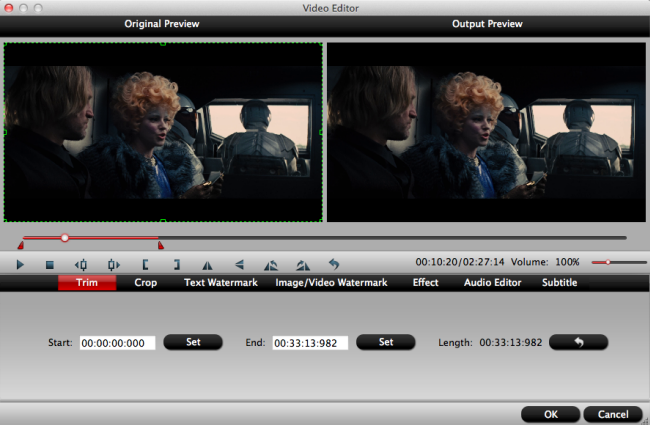 In the editor window, choose the “Trim” tab and this tab is selected by default when the editing window appears. You can use the trim function to cut off unwanted audio parts from start and end. You can either drag pointers on the process bar or set exact time point in Start and End boxes to set. 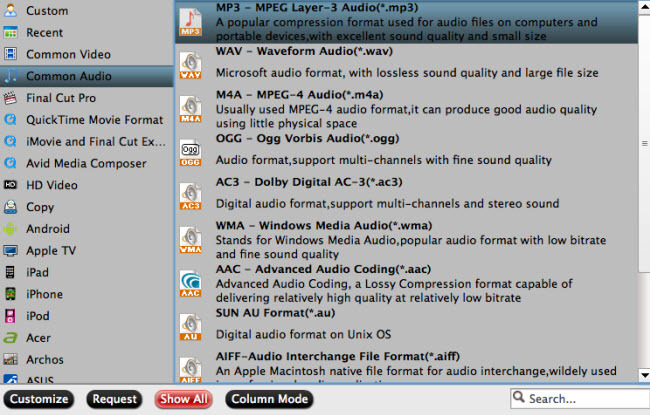 By checking the “Merge into one file” option beside the “Settings” button, the program will join all the selected audio clips into one single file. Hit right-bottom conversion button to start FLAC to your desired audio format conversion process immediately. When the conversion is done, you will have no limitation to enjoy your music or song anywhere at anytime as you like. How to Copy DVD to External Hard Drive?